This entry was posted in Comments about Cycling on August 14, 2014 by Steve Tilford. I just found out a little while ago that a long time friend, and a guy I’ve been riding bikes with, since I as a kid, was hit by a car and killed today. Cal Melick was out riding by Long Star Lake, near Lawrence, when a car was passing another car, and hit Cal head on. Man, super bad luck and tragic. Cal was on the first team I rode on, a team that was organized by Gene Wee from the Kansas University Student Union. He quit racing a long while ago, but always kept riding. He led weekly rides of the Lawrence Bicycle Club. He also worked here in Topeka at Washburn University, at the library. He was a super nice guy, soft-spoken, and a real cyclist. 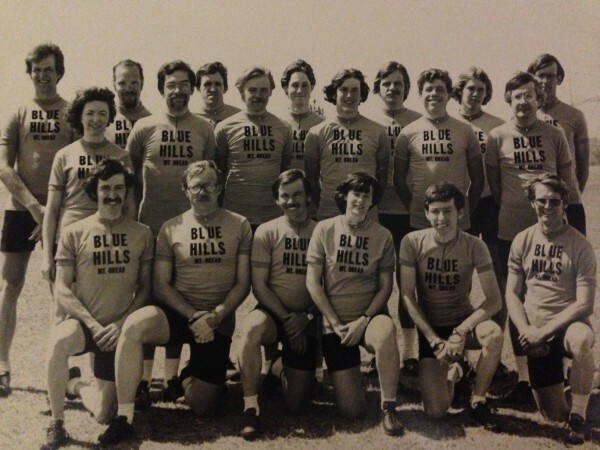 Below is a picture of our team, which was sponsored by Blue Hills Bike Shop in Kansas City. Cal is 2nd from the left on the 2nd row. Right below Cal, kneeling, is Jim May, who was also killed, hit by a motorcycle during a training race in Wichita. Man, that is over 10% of our team. I sure hope Jim and Cal are together now, where ever that is. Jim was always super funny, so I hope that he and Cal can share a few laughs, maybe with Robin, while riding into eternity. Video of where the accident occurred. People getting hit seems to be happening a lot lately. Something has to be done about the cell phone usage in cars. That’s why I mainly ride mtb’s now. Sorry about your friend Steve. My thoughts are with you Steve, and with Cal’s friends and family. Always a mentor and friend. Pax, Cal. Frustrating. Infuriating! I was hit not too long ago and have suffered some permanent damage, but I will ride again, fortunate for me, not at all for Cal. I wish everyone using the roadways would think about their actions and what kind of impact they have on so many people. The list is huge when you think about family, friends, loved-ones, and the community as a whole- it is not worth making a risky decision to shave one minute off of your drive time. Best wishes to Cal’s Family. Safe riding everyone!!! You never know when it’s going to be your day. So sorry for you and everyone who knew him. THIS cannot be allowed to continue ! i gave one to Chris Horner , who instead of following my wish to do a Photo Op with the Depart Village Major , folded it into his pocket . Would the Publicity generated in Tuscany , have saved him weeks later on Lago Como , when he was rear ended ? i doubt it ! But has he done anything for Cycle Safety , since ? I doubt it ! Any of you seen the placards from Vision Zero , or downloaded them ? I carry a few , laminated , in the front of my shirt , then i go to the boss of the vehicle that causes me grief , and have them copy it , for their ” Lunch Room / Sign on Clock /reception , so as to get maximum exposure . It is noticable how wide their vehicles are when they next pass . Had Cippolini not also put that placard in his back pocket , would he have avoided today’s visit to Surgery ? i doubt it ! I visited Aigle during the Tour de Romandie , to discuss ACTION with Cookson , fobbed off by the secretary when i sought a 5 min formal meeting , i gained a 30+ sit down in the cafeteria , where we reviewed quite a lot of ideas ! Got the shirt to prove it , but missed out on the Bib Shorts ! Drat ! @BrianCooksonUCI @gaudryt 1st Horner now http://cyclingtips.com.au/…/cipollini-hospitalised…/ … Guess UCI need not look after Cyclist SAFETY? O/due? pic.twitter.com/zI06U7I2OT ADD to this Bad Luck to Cipolini , the fact that Steve Tilford reports the following : http://stevetilford.com/2014/08/14/cal-melick-rest-in-peace then you will see WHY , i think that UCI has to get OFF it’s COMPLACENT ARSE and start to LEAD THE WAY ! Whilst i nit pick with my ” Placards ” for 1 1/2M Safe Pass of Cyclists , which is the LAW in most of Europe , most of those OVERPAID RACERS are happy to be photoed signing a variety of “Petitions ” but when it comes to campaigning on their Social Media Outlets , WHERE are they ? At the Tirrano-Adriatico , i gave Chris Horner a copy of the placard you see here ( this has ” Le Tour , rather than WorldWide “), i asked him to do ” Photo Ops with the Town Major ” , he folded it into his pocket and a few weeks later got rear ended in a tunnel near Lago Como ! In Italy 1 1/2M is the LAW , so i guess that explains why the anonymous driver kept going ? THERE is No longer any excuse for UCI to sit on it’s hands , Cycle Safety is a World Wide Problem , needing addressing at the UCI Congress in Ponferado in September ! What is needed is a CODE of CONDUCT , to be utilised by the Pro Racers when out training on the roads ! They must be required to ” Salute ( Touch the Helmet ) when passed by a Vehicle that gives 1 1/2M Safe Pass with Signals ! THe UCI needs TODAY to draw up a ” Manifesto ” that can be passed to EACH National Cycling Federation ASAP requiring them to contact ALL Motoring Organisations , Trucking Orgs , Bus & Coach Orgs , Taxi Councils and the Media of their Country advising that the Racers are required to acknowledge GOOD Behaviour and by the same token report ALL dangerous Drivers . When those that make their living driving , know they will gain respect for their Good Behaviours , do you think they won’t want to be seen by their colleagues receiving ” Salutes “? As the ” Want to be s “, that emulate their ” Pro World Racers ” , see the Profi.s doing this , then they will decide to do this also . Very quickly the Media will pick up on the ” Courtesy Gesture ” and PERHAPS , we will see less ” Careless/thoughtless/aggressive Actions against Cyclists on Roads”? WHAT ARE YOU the readers going to do NOW ? Address YOUR Cycling Club ? Address YOUR National Cycling Federation ? Well staying home on the computer , will keep you safe from the next mad dog , that thinks you do not count ! The Life you HELP SAVE , could be YOUR OWN ! Cal was an inspirational person and very good at teaching freshmen information literacy. He impacted so many during his three decades at Washburn University. I have met many librarians and Cal always wanted the student to find and create knowledge. He was truly one of the good ones. My condolences for the loss of your friend. I wish the media and others would quit using the term “accident” when talking about crashes caused by human error. Killing someone with a car needs to be taken as seriously as other ways of killing people. We need to remember we are driving a potential deadly weapon. I wish bicycle and pedestrian safety issues were addressed in the drivers’ test. Tragic! Seems we are dropping like flys. Is it getting worse? Or just more info? Hey I did the water bottle once with an oncoming. When they turned around & caught up to me, I said: “i thought you were in a hurry…?” Use that everytime someone wants to stick around for commentary. Try it, they usually move on…while seeing how stupid they are? Also, as of your am posting, authorities hadn’t released the name. Might consider honoring that? Wow, what are you on? Can I get some of that? To this day I wish I could tell Jim May’s widow how fun her husband was to ride with. He had Humor. And a damn cool Benoto. Laurie,you’re dead on- that is not an accident,it is criminal negligence. Yes James, it is happening Sr an increasingly high rate. While rate of serious carvcar accidents is rising slowly, incidents with pedestrians/cyclists are rising fast. Cell phone sales have increased at a similar rate. I’d guess phones combined with a sense of entitlement. sorry for the loss. Godspeed to his family and friends. I am in shock and so sad about this. Really sad. Beyond words sad. Speechless. Cal was one of the nicest people i have ever met. He made such an impression on me on and off the bike. We would ride a draft about 2″ apart. He was so steady and strong on his bike. It was such a joy to ride with Cal. He just went down the road so smoothly. Boy could this guy ride! I had the opportunity to ride alongside of Cal on many a BAK and Octoginta and Lizard under the skillet rides We rode together and then remained friends on and off the bike. This is before e-mail and cell phones. We exchanged letters and telephone calls. He was such a mild mannered person with the highest of integrity. Second to none he absolutely one of the most fun and best riders I have ever ridden with. To this day, I remember the feeling of nirvana going down the road with Cal and his friends. Smooth, seamless. A great sense of humor, a friendly and kind person. Very passionate about cycling and a very good cyclist. His sense of humor was almost kiddish and he got a kick out of a witty line or funny conversation. Tears stream down my face as I write this. I am very, very sorry for Cal’s family and friends. I know he leaves in his wake a tremendous amount of people who love him and a legacy of kindness. He loved cycling. He loved his friends. He took his work seriously and I am sorry that our next meeting will be in heaven. This is a tragedy because Cal is missing another day to ride. He loved many things and his bike riding was one of these things. He did not deserve such a tragedy. His walk on earth was filled with kindness, a witty sense of humor and a genuine love for his bike. Cal, I am sorry for any pain you may have suffered. I am sorry for your family and friends. I am sorry to all of you with and around Cal on a regular basis. He is sorely missed from far away and I cannot imagine the world without Cal enjoying the beautiful weather, scenery and serenity of life. Cal was an awesome person and my life will not be the same knowing he is not going down the road.